Puma welcomes its archival CELL Endura silhoutte back after it’s introduction in 1998. Today, 20 years later the CELL Endura has been updated and made with the newest technology. With its chunky silhouette, it couldn't have find a better comeback than today. The upper is constructed out a combination of mesh, leather, and suede. Station and highlights the futuristic vibes around the CELL Endura . 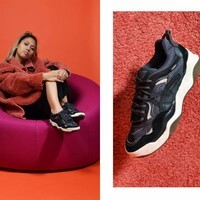 The Puma CELL Endura will be released October 4th at Maha.